Every year thousands of tourists are drawn to the Lake District to see the sights associated with the children’s author Beatrix Potter. One of the most popular attractions is the World of Beatrix Potter in Bowness. Visits begin with a short video about the life of the author and her tales. A winding path then leads visitors through a series of displays that bring the tales to life. Interactive screens at each display provide information about each of the tales and the inspiration behind them. One of the most recent additions to the attraction is the Peter Rabbit Garden. Designed by award-winning garden designer Richard Lucas, the garden brings to life many of Potter’s original illustrations. Features include a Victorian greenhouse, Mr McGregor’s scarecrow, and Peter Rabbit’s gate. The garden is also home to the ‘Enchanting World of Beatrix Potter’, a 15ft tall bronze sculpture by Anthony Bennett depicting three children releasing Jemima Puddle-Duck. It was unveiled in 2006 by actress Renee Zellweger who was in the area filming the Miss Potter movie. 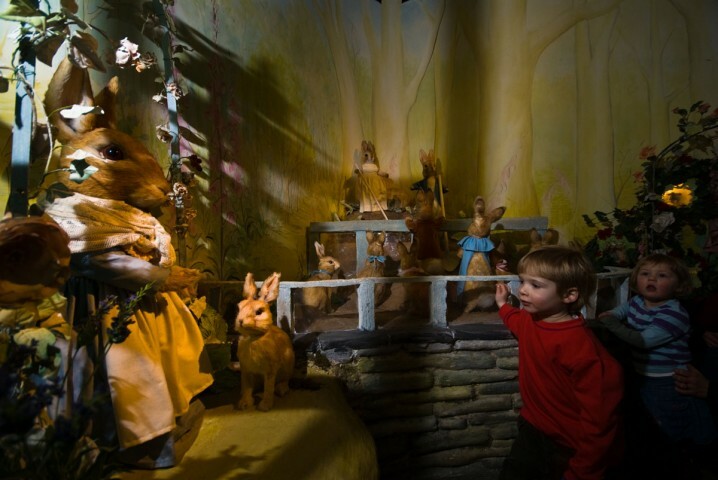 The World of Beatrix Potter is open 7 days a week. Opening hours are 10 am to 5.30 pm in the summer and 10 am to 4.30 pm in the winter. Tickets currently cost £6.75 for adults, £5.75 for pensioners, and £3.50 for children. The World of Beatrix Potter is situated on Crag Brow in the centre of Bowness. The nearest car park is on Rayrigg Road (LA23 3BZ). The attraction is just a few hundred yards from the Bowness ferry terminal. From here Windermere Lake Cruises offer boat trips to Ambleside and Lakeside. Other sights and attractions in the Lake District associated with Potter include Hill Top at Near Sawrey, the Beatrix Potter Gallery in Hawkshead, and Tarn Hows. Map showing location of World of Beatrix Potter. We regularly visit when in the area. An outstanding attraction that is always making additions – the outdoor garden is super. Very reasonable admission charges and excellent standard of food in the tea room. 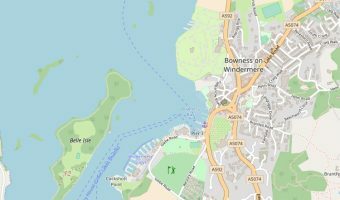 Interactive map of Bowness. Includes hotels, tourist attractions, transport links, and more. 5-day weather forecast for Bowness. View temperature, wind speed and chance of rain.